We’ve put together a list of kit that we recommend that you pack for your fly fishing experience on Islay. We’ve marked items so that you can see whether we can supply you with them and whether we consider them to be essential to ensure a successful fishing trip on Islay. The weather on the Scottish West Coast can be unpredictable to say the least so it is best to arrive prepared for any weather and fluctuating air temperatures. We think a 9ft 5wt rod is a good all round option for the loch fishing on Islay. We can provide rods if required. Having a second option of a 6,7 or even 8wt rod is good in case the wind gets up or if you would like to enjoy some sea trout action whilst on Islay. If you would like to buy a rod, we’ve included links to retailers at the bottom of this page. You will require a reel that feels right with your rod, and which is the correct size for your line weight rating. Having a reel with a good drag system is a good idea, you never know what you are going to strike in to on a wild Scottish loch. If you are going to fly fish in the sea, you will need a saltwater proof reel, and ensure that it is washed in freshwater thoroughly after use. We can provide reels if required. If you would like to buy a reel, we’ve included links to retailers at the bottom of this page. 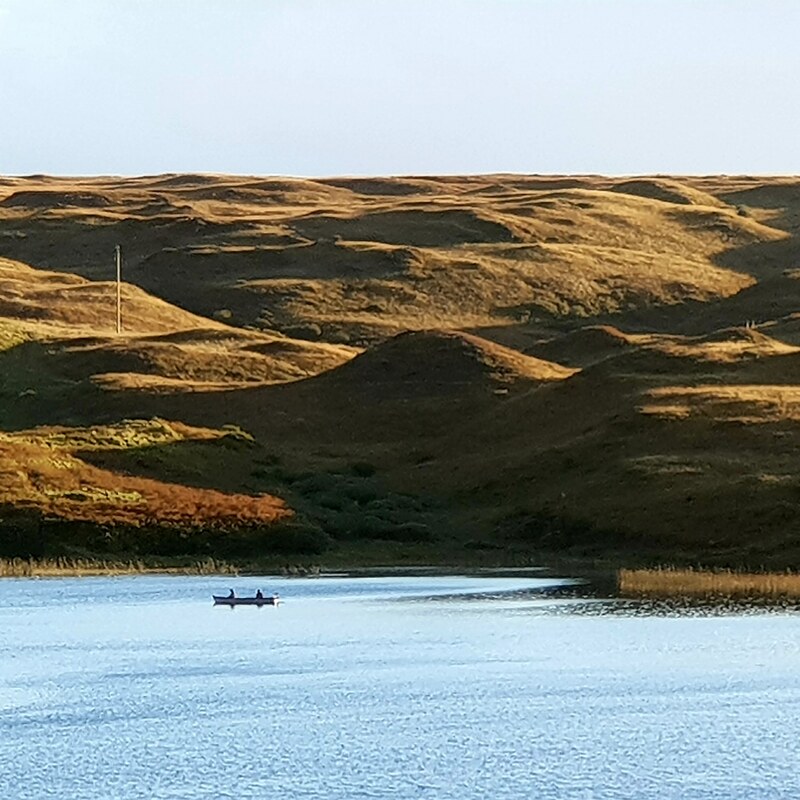 You will need a fly line that is the correct weight rating for your rod, again for all round fishing on Islay we recommend a 5wt floating weight forward fly line. Some anglers like to use midge tip, intermediate or even fast sinking fly lines to seek out the fish. We like to keep it simple, we often see anglers frequently changing lines to find the fish, far better to keep moving to different spots until you find fish. If you would like to use our reels they are provided fully loaded with 5wt lines. 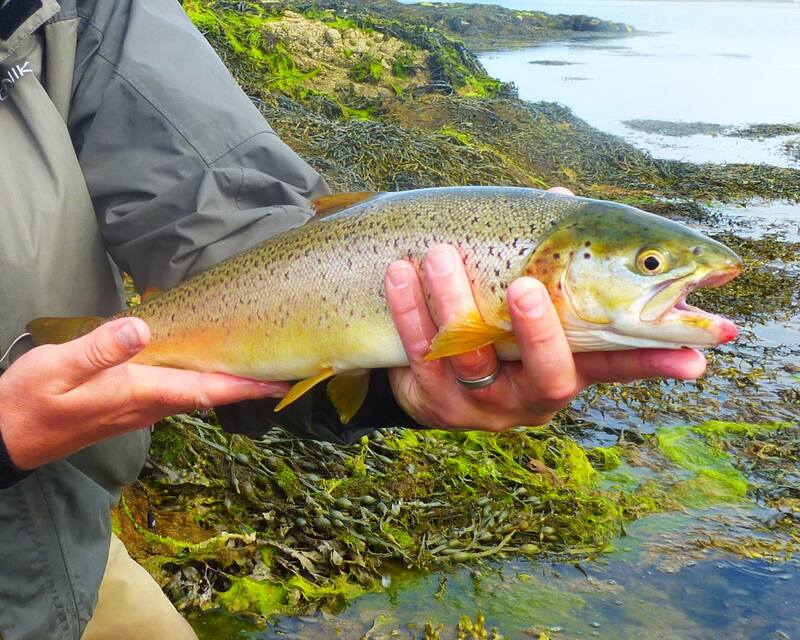 We ask all guests to ensure that they bring chest waders to Islay with them. It is a good idea to check them for leaks before you arrive as leaky waders can ruin a good fishing trip. 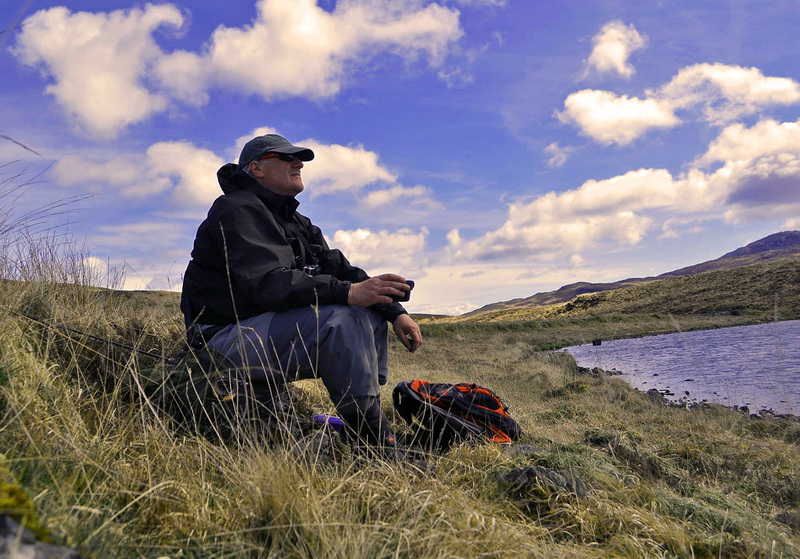 We often fish hill lochs reached by a good walk so lightweight breathable waders are the best. There are many wading boots on the market, we recommend that you shop around and always use studs in the soles to avoid slips. Waders and boots are essential kit. Please see a couple of links below for ideas. A waterproof jacket is essential when fishing on Islay. There are many wading jackets available to buy, we recommend you find a lightweight jacket with plenty of pockets for storage of tackle. I good quality walking jacket can be a good substitution particularly if you don’t fish regularly. We use Wychwood Connect Series Lure Mode or Fulling Mill World Class Fluorocarbon when fishing with teams of wet flies. We also use Stroft GTM or ABR low diameter monofil particularly when fishing with dry fly patterns. We sometimes us Fulling Mill or Hardy tappered leaders when fishing with dry fly patterns. We can provide tippet and leaders to guests. A sharp line nipper and pliers attached to a lanyard or zinger are essential for snipping tippet and removing flies. See retailer links below. We provide all guests with a fly box and a selection of our own fly patterns. Bibio, LTD Sedge, Retirer Sedge, Sedgehog, Snatchers, Griffiths Gnat, F Fly, Hoppers, Muddlers, Black & Peacock Spider, Zulu, Kate McLaren, Watson’s Bumble, Soldier Palmer, Teal Blue & Silver, Black Pennel, Butcher. We like to fish with dry fly patterns whenever possible. Floatant is essential for ensuring your dry fly is presented correctly. We use Gink or Fulling Mill Dry Sauce. We supply floatant to all guests. These are all essential items and all guests are asked to use them when fishing with us on Islay for their comfort and safety. These can be purchased via the retailer links below. The weather can be unpredictable on the West coast of Scotland so it is advisable to prepare for all conditions. Lightweight walking clothing is perfect when used in conjunction with base layers and adjusted for the weather conditions. 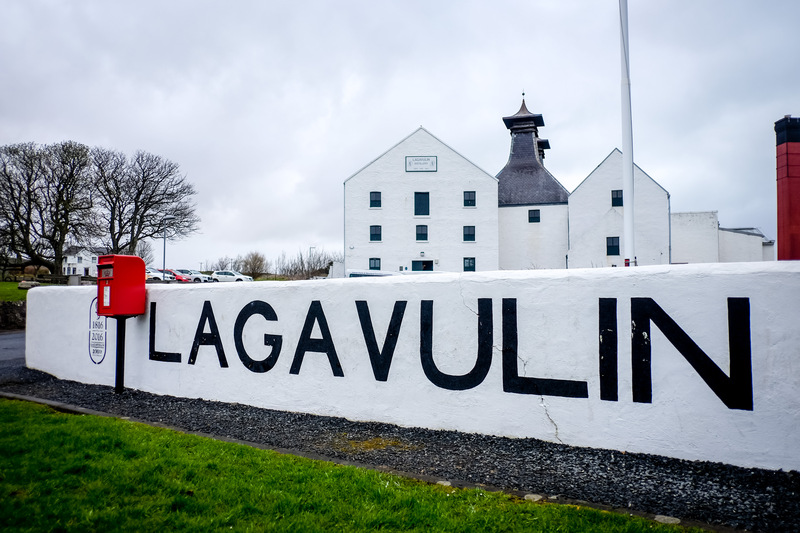 A long sleeved shirt protects from the sun and hopefully there will be plenty of that during your stay on Islay, but it is good to pack warm socks and a good fleece just in case. All fishing permits are organised by us for our guests. There is no need to purchase an Environment Agency rod licence as this is NOT required in Scotland. If you require any further information about tackle and clothing for your trip to Islay please don’t hesitate to contact us.